Callisto is the archenemy of Xena the Warrior Princess. She was created by writer RJ Stewart and originally was only intended to be in a single two part story. Her popularity however would ensure that she would recur throughout most of the series run, and even make crossover appearances in the sister show, Hercules the Legandary Journey’s. Callisto really served as a classical nemesis to Xena. She was in many ways her dark twin. Someone who had been corrupted by her past into being evil like Xena herself had once been, but unlike Xena was seemingly beyond redemption. She also possessed all of Xena’s many skills, and was a perfect match for the Warrior Princess in every respect. Though the character sadly never really entered into popular culture the way certain other villains have, such as Faith Lehane, The Daleks or Khan. She is still nevertheless a favourite of many sci fi and fantasy fans around the world and remains in my opinion one of the best realised examples of the archenemy trope. Callisto first appears in the season 1 episode “The Greater Good” in a tiny voiceless cameo where she shoots Xena with a poison dart. The remainder of the episode sees Xena out of action due to the poison, whilst Gabrielle has to take on a vicious warlord by herself. In the following episode titled “Callisto” the character makes her first full appearance. In her first scene she is shown to murder a helpless child whose throat she casually slices open, whilst he is looking for his parents amidst the murder and mayhem her army is causing. She then spares an old woman, not out of kindness but just to let people know what she did here. She then tells the old woman that her name is Xena the Warrior Princess. Xena later finds out what is going on from the boy Callisto murders father, who initially attacks Xena believing her to be the murderer of his child. She tracks Callisto down in the middle of slaughtering a village where Callisto reveals who she really is to Xena. Callisto comes from a village called Cira that Xena’s army burned to the ground when Xena was a ruthless warlord. Xena had attempted to merely conquer the village, but she caused a fire that got out of control. Almost all of the villagers died, including Callisto’s entire family,. Callisto who was one of the few survivors was driven completely insane and vowed revenge on Xena. After Xena changed her ways and sought redemption, Callisto’s hatred only increased. Feeling sick at the idea of Xena, the woman who torched her family being celebrated as a hero. Callisto poisoned Xena with a dart, not to kill her, but just to put her out of action for a short while so she could begin slaughtering and burning villages under the name of Xena. A young Callisto watches her family burn slowly to death. Xena later defeats Callisto. Callisto proves to be a formidable fighter who is even able to catch the shakram, something that Gabrielle is only able to do after 6 years of training from Xena herself. However where she is ultimately inferior to Xena is that she lets her psychotic rage often get the better of her, whilst Xena is always able to remain control and calm in any situation. Xena finds that she is unable to kill Callisto out of guilt for what she did years ago and puts her in prison. Callisto however quickly escapes and captures Gabrielle. Using her to lure Xena into a final showdown, Xena defeats Callisto once again. Callisto at one point even attempts to kill herself but Xena saves her much to Callisto’s anger. Callisto is once again sent to prison, and though Xena feels it was the right thing to do, Callisto assures her that it wasn’t not only for her sake, but for all of the other innocent people she will kill too when she escapes again. This episode is I’d say the best ever episode of Xena Warrior Princess. This was really the episode that I think made the show. Prior to this Xena had really just been an inferior, female version of Hercules with Xena’s past as a vicious warlord barely even mentioned apart from in a few episodes. However this was where the show really stamped out its own identity. This episode reminded us that Xena had once been a blood thirsty warlord who had killed innocent people and was now getting away with it. Regardless of the good things she does now, her past will always catch up with her in some way or another. I think this episode got Xena’s darkside down right. A lot of later episodes would go too far in making Xena evil. Portraying her as a monster who tortures and kills hundreds of innocent people for no reason other than sadistic cruelty. I never liked that take on “Evil Xena” as I felt it stretched the credibility of the character too far. Its hard to believe someone like the “Evil Xena” from the later episodes who does things like tie teenage girls up, cut them over a pool of water and allow crabs to cut their limbs off could ever repent her actions. At this point “Evil Xena” is portrayed as someone who became a warlord simply because she was born into a violent and brutal time. She was obviously ruthless, but not sadistic. She still possessed a code of honour, never murdered children and always did her best to keep civilian casualties to a minimum. This is seen by the fact that she did not mean to burn Callisto’s family to death. She merely attempted to loot the village, but it was one of her men who accidentally caused a fire that burned the village to the ground. You can imagine that even during her darker days Xena would have been haunted by this event. This episode also established that Xena was a lot darker and somewhat more nuanced than Hercules too. Callisto is a very tragic and sympathetic character. 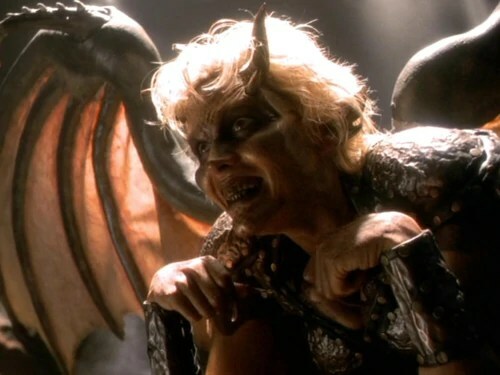 Despite this she is also arguably the most evil and wretched villain in either Hercules or Xena at this point. The first thing she does is cut the throat of a young, helpless boy. Yet despite this we feel sorry for her. That’s pretty strong writing (and also acting from Hudson Leick who is excellent in the role) to get us to feel sorry for a character that murders children and enjoys it! How many characters can you honestly say that about? Even though Callisto is a total monster. She is the character that in any other work of fiction we would root for and hope triumphed over the person who wronged her. The situation between Xena and Callisto is similar to that between Uma Thurman’s The Bride and Vivica A Fox’s character at the start of Kill Bill Volume 1. In both occasions we have someone who has done something horrible to someone else, but who now regrets it and seeks redemption and is even having a nice life. Vivica Fox’s character tortured and nearly killed, along with several other assassins, Uma Thurman’s character and robbed her of her chance to raise her child. Now however Fox’s character has a family and is genuinely sorry for what she has done. However that changes nothing for the Bride. She much like Callisto finds no solace in her tormentors redemption, but unlike with Callisto we are supposed to root for The Bride. The Bride is the main protagonist despite being in exactly the same situation as Callisto. Callisto offers a fresh take on this type of character, as in Callisto’s case it is the main hero who is the one who wronged someone. Thus we can’t quite root for Callisto the same way as we would for the Bride even though we really want to. Its a wonderful new take on the hero, archenemy trope in general. There had been many examples of the villain feeling guilt or even a sense of responsibility for the villains actions. Batman made the Joker by accidentally knocking him into a vat of chemicals, whilst even Superman feels guilt in some interpretations over having not done enough to help his friend Lex Luthor. However I don’t think it had ever really been like this before where the hero had done something so terrible to the villain. Something that like I said in any other version would actually be the heroes main motivation against their worst enemy. It helped to make Callisto and Xena more than just another cliched hero and archenemy feud. Incidentally Quentin Tarrrantino who directed Kill Bill is a huge fan of Xena and even cited Callisto as one of his main influences on The Bride. Its very rare to have the hero be unable to justify themselves to the villain. When Callisto tells Xena she made her she is 100 percent right. Why should Xena be allowed to go free? Justice doesn’t work where you get to decide how you have paid your debts. Xena thinks she is paying them by walking the countryside with her sidekick who thinks the world of her becoming a celebrated hero and doing good things to ease her conscience. Understandably the people she wronged and the people whose families she butchered are not going to see that as her paying her dues. Callisto also presents a terrible dilemma for Xena as well as a gruesome reminder of her past. Xena knows, even though it was an accident that she is still responsible for Callisto’s actions. Does she of all people really have the right to end her life? She will just be finishing the job she started decades ago, yet if she doesn’t more innocent people will be slaughtered. Both Xena’s ruthlessness and her compassion ironically will cause more innocent deaths. Still whilst the audience is invited to feel sorrow for Callisto, the episode suggests that perhaps Callisto’s dark nature does not stem entirely from Xena’s actions. In this same episode we are introduced to the character of “Joxer the Mighty” played by Ted Raimi. Joxer is a hopeless wanna be warrior who thinks that he wants to join Callisto’s army, but when given the chance to actually murder a defenceless Gabrielle. He refuses and would rather die than take another life. Callisto meanwhile murders children without batting an eye lid. This shows that some people are more capable of it, even if it is just because of the tragic circumstances in their lives. Callisto is more capable of murder and senseless cruelty than Xena even when she was at her worst was. Xena much like Callisto was driven down a dark path due to the loss of a loved one. In her case her beloved brother who much like Callisto’s sister was murdered in a pointless conflict, but she never stooped so low as to intentionally murder children. This was seen even in Xena’s appearances on Hercules where she spared an infants life and was forced to run the gauntlet by her own men as a result. Overall I would give this episode 5 out of 5 stars. There isn’t really anything I can fault about it in any way shape or form. Not only is the writing and acting top notch, but the direction is also perfect too, particularly in the final fight between Xena and Callisto on the ladder, which is one of the most thrilling fight scenes in the entire series. Originally it was intended to make this story a two parter, but ultimately Callisto’s second appearance was pushed forward until the next season. Callisto’s next appearance simply titled “The Return of Callisto” was also written by her creator RJ Stewart. The premise sees Callisto escape from the prison Xena left her in. She frees the rest of her army from prison (after making her captor squeal like a pig in pain, literally). Callisto goes on a massive rampage, slaughtering many more innocent people, including Gabrielle’s new husband Perdicus. Gabrielle consumed with grief tries to murder Callisto when she sleeps, but finds she cannot and ends up waking Callisto up. Callisto captures her and uses her to capture Xena. With both of them at her mercy Callisto prepares to torture them both to death, but they are freed (inadvertently) by Joxer. Though Joxer is no match for Callisto, his bumbling attempt at a rescue allows Xena to get free. She pursues Callisto and the two after another intense battle fall into quick sand. Xena escapes by throwing her chakram onto the hill beside them and throws a rope around it, which she uses to pull herself to safety. She just leaves Callisto to sink into the sand however. Callisto begs Xena to save her (despite her suicidal tendencies earlier) but Xena responds with a cold stare, and Callisto sinks screaming under the quick sand where she dies of suffocation. Return of Callisto is an absolute classic episode of Xena that really helps to move the story between Xena and her sworn enemy on brilliantly. Once again we see how Callisto’s darkness is not entirely down to Xena. Gabrielle suffers a similar loss but ultimately is unable to kill even Callisto herself. I like the way that Callisto even admits she is jealous of Gabrielle just before she attempts to burn her to death, because Gabrielle gets to leave the earth so pure and innocent. There are also another couple of interesting insights into Callisto’s character such as when we discover that one of her most loyal men has fallen in love with her, but Callisto is so dead to emotion that she not only can’t experience love herself, but even warns her henchman that if he is in love with her she will have to kill him. Really the only thing that drags this episode down is Gabrielle’s love interest Perdicus. Perdicus is such a boring, sappy character and he and Gabrielle are a revolting schmoopie couple too. I was waiting for Callisto to gut him like a fish to be honest. Its an old trope having the archenemy kill a friend of the hero to make them seem menacing and it normally works, but here I guess Perdicus was just so boring nobody cared sadly. Oh no Perdicus has been killed off. Said no one ever, anywhere, at any point. The best part of Return of Callisto is its final scene which sees Callisto suffer the first of her many deaths. This moment really stuck in my head when I first watched it as a young boy in the 90’s. It was so shocking watching Xena just let a pleading Callisto sink to her death. I have always said its more shocking to have the hero do something horrible to the villain, but this wasn’t even like Superman promising Darkseid that he was going to be a smear on his fist. What was even more disturbing about this scene was the way that Xena ‘s reaction to it is so cold. Xena is not killing Callisto out of rage and anger. She is doing it for purely practical reasons. She realises that Callisto is beyond redemption. Xena has tried to get through to her better side, and given her chance after chance, but its now obvious that Callisto does not want to change. Or even if she does who knows how many innocent people she will have killed before then. Does Xena have a right to risk so many more innocent people’s lives just in the off chance that Callisto decides to change like she did? No she doesn’t, so for purely practical reasons Callisto has to die. Thus she shuts off all of her emotions. Her anger, her compassion, her guilt. She just stares at the terrified and pleading Callisto with no expression whatsoever. Lucy Lawless’s underplaying of the scene is just perfect. Once again this scene demonstrates how the Xena/Callisto feud is not just a simple case of black and white, good vs evil like Batman and the Joker. Xena’s actions here are utterly deplorable. Not only is it ruthless and cold but also complete moral cowardice too. She knows Callisto has to die, but she can’t bring herself to actually murder her out of guilt for what she did to her family. So she just doesn’t save her. That way Callisto’s blood wont technically be on her hands. Its disturbing to think that in many ways Xena is delighted when Callisto falls into the quicksand. She can’t believe her luck. Here this evil, relentless enemy of hers who will keep slaughtering innocent people just to spite her, and who she knows she wont ever have the moral courage to kill has fallen into quick sand and is going to die in a way where she wont have to actually kill her. All her problems have been fixed by this sheer dumb luck. In addition to repressing her guilt and sorrow over Callisto when she watches Callisto die. Xena is probably repressing her joy and relief at this horrible situation finally coming to an end. It would have actually been more humane of Xena just to simply stab Callisto when she was trapped in the quick sand and finish her off quickly. Instead she lets Callisto sink underneath it, where Callisto much like the rest of her family will die a slow and lingering death. However at the same time can we really blame Xena. Yes it was cowardly and ruthless, but if she had pulled Callisto out of the quicksand and stuck her in a prison then she would most certainly have escaped and burned more villagers and killed more innocent people, possibly hundreds more before being put in prison and escaping yet again to cause more death. Xena just does what we wish every hero would do. Think of how many people Batman could have saved if he had done this to the Joker. There’d probably be less graveyards in Gotham! So whilst Xena’s actions may have seemed dirty and underhanded, ultimately what was she to have done? The situation with Callisto was horrible and there were no easy ways out of it. Its also quite a nice touch to see Callisto actually terrified of dying. In her previous appearance she tried to commit suicide many times. When angry villagers toss a torch into the prison she is being kept in she doesn’t even attempt to flee from the flames and just stands there barely reacting before Xena saves her. Similarly at the end of her first episode after losing her battle with Xena, she throws herself to her death and screams out in fury when Xena catches her. Here however when it becomes apparent that Xena isn’t going to save Callisto this time. We see genuine, outright hysteria as she sinks lower and lower. This goes to show that there was a dark side to Xena that even Callisto didn’t know about. Ironically she of all people who had suffered the most due to Xena’s darker nature, had in fact underestimated how ruthless Xena actually could be. .
Callisto’s undignified and pitiful end. Originally the intention was for Xena to save Callisto in this sequence and this alternate scene was even filmed, but fortunately it was decided at the last minute to have Xena just let her die. I am so glad they made the right decision. It just would have been so much worse if Xena had spared Callisto. It not only wouldn’t have seemed right for their relationship, but it also would have made this episode just a total remake of the first Callisto episode if they had done that. Callisto gets out and does shady things and Xena saves her and puts her in prison at the end and Callisto vows she is going to get her. That type of story is okay for comic books, but in a tv show where you have limited time I think you have to move the story on and that’s what this episode did. It raised the Xena and Callisto feud to a whole new level by having Xena wrong her once again. The original ending. In an alternate universe Xena spares her nemesis from her grizzly fate. Of course just because Callisto was dead did not mean that we wouldn’t see her again. Oh no far from it. In this episode Callisto’s spirit is able to attack Xena in her dreams. Constantly tormenting her and playing on her guilt over having murdered her. It is revealed that Callisto is being aided by Ares the God of War who is able to switch Callisto and Xena’s minds allowing Callisto to live in Xena’s body whilst Xena takes Callisto’s place. In Xena’s body, Callisto begins a relationship with Ares, but ultimately he discovers that she is just using him and he leaves her. Xena meanwhile is given one day to bring Callisto’s soul back to Hades or else she will take her place there forever. Callisto very nearly burns Xena’s village to the ground, but Xena with the aid of Joxer and Gabrielle is able to knock Callisto out. Whilst Callisto dreams Xena has the ghosts of her victims confront her. With Callisto’s own mother being among them saying that even though she still loves her daughter, she must face her own sins. Callisto for the first time is overwhelmed by the guilt of what she has done as her victims souls confront her. Xena is able to subsequently defeat her and take her place on earth albeit whilst still in Callisto’s body. “Intimate Stranger” is an old idea of the villain switching bodies with the hero, but that still doesn’t stop this episode from being yet another classic. To start with Lucy Lawless and Hudson Leick clearly relish the opportunity to play something different from their usual roles. Lawless is delightfully over the top as Callisto. I think she doesn’t get the credit she deserves as one of the greatest hams of all time. I mean we are talking William Shatner, Tom Baker level of being a ham. No performance better demonstrates that than her turn as Callisto. However Hudson Leick I think is really the one who steals the show. Though that is often the case in stories where the hero and villain switch bodies. The actor who normally plays the hero looks like they have more fun, but the actor who normally plays the villain really gets a chance to show off their serious side more. Just like “The Return of Callisto” the best moment is the final confrontation. Here in a great twist its Callisto’s own mother, someone who Xena killed, that helps Xena defeat her. Callisto’s own mother is horrified at what her daughter has become and wants her to stop, but the only way she can get that is too make her face the responsibility for her own heinous actions. It is true that Xena wronged her, but she did not need to do any of the horrible things she has done. As Xena points out to her, how many of her victims had families just like hers that she torched? What has become of the man whose son she cut down in cold blood in her first appearance? Ultimately she cannot blame Xena for this. She made her own choices and she must pay for them and that’s why even her own mother, herself a victim of Xena forces her to face those she has wronged. It also shows us how despite what she says Callisto is not so entirely dead to emotion. She cannot bare to look at the men, women and children she butchered in her crusade even for a second. All the guilt that she has spent ages repressing comes flooding out and its enough to practically destroy her. This episode also starts the Ares/Callisto relationship which would lead to some interesting stories across both Xena and Hercules. Overall “Callisto, “The Return of Callisto” and “Intimate Stranger” together serve as an excellent trilogy. They develop the Xena/Callisto relationship over all three episodes perfectly. In the first episode Xena is so guilty over what she did to Callisto that not only can she not kill her, but she actively stops other people from killing her and even stops Callisto from committing suicide. However by her second appearance Xena realises that Callisto will never change and has to die to save others. She still can’t bring herself to kill her however and lucks out when Callisto falls into the quick sand and she wont have to kill her. The final story sees Xena face the consequences of her cowardly actions in leaving Callisto to die and admit that what she did was just as bad as cold blooded murder anyway. Still ultimately it also finally sees Callisto face the truth about herself as well. Callisto is responsible for what she became. This has been hinted throughout the first two Callisto episodes where we see other people endure tragedies yet not go down the same path as she did. First of all there is the man whose son Callisto murders in the first episode who tries to murder her, but after his actions very nearly cause Gabrielle’s death he realises the horror of what he has done, and what he is in danger of becoming and forgets his feud with Callisto. Gabrielle herself loses her husband, but ultimately finds she is unable to take another life even Callisto’s. Even Xena fits this pattern to some extent as she lost her brother and unlike Gabrielle she did go down a dark path, but even she never went as far as Callisto did and was ultimately able to pull herself back from the brink. Callisto however became a monster and killed hundreds of innocent men, women and children. At the end of the day she is responsible for those crimes, not Xena, and unlike Xena who was never as bad as she was; she was given chance after chance to stop but she refused. In many ways Xena and Callisto’s relationship is like that of a child who is abused by their parents and spends the rest of their life making mistakes and blaming everything they do on that. Hudson Leick would play Xena who was still trapped in Callisto’s body for one more episode before Ares switched them back, but we wont be looking at that episode as its not really a Callisto episode. The only reason that Xena and Callisto didn’t switch back immediately was because Lucy Lawless had injured herself and thus Hudson had to fill in for her for one episode. Callisto would next appear on Xena’s sister show Hercules. This followed on directly from her last appearance in Xena. Callisto makes a deal with Hera to be released back onto earth to kill Hercules. Callisto is more than happy to not only because she will be given new life, but also because she wants to make Hercules, the man who redeemed Xena and saved her soul pay. Callisto is given one day of life to kill Hercules. Not trusting Hera due her past alliance with Ares, she decides to trick Hercules into giving her immortality. She poisons his family and says that the only cure for the poison is magic apples, which can be found in the Labyrinth. If a dying person eats them they will be cured, but if a healthy person eats them they will become immortal. Hercules is forced to help Callisto make her way past the numerous traps, puzzles and threats in the Labyrinth to get to the apples. Callisto naturally turns on Hercules once they reach the apples and devours one of them gaining her immortality. However Hercules is still able to defeat her and both scar her and leave her trapped in the maze of the Labyrinth and use the apples to save his family. Callisto was the first major Xena villain to cross over into Hercules. After this Ares would appear and go on to become a major villain in Hercules. Surprise is overall a great episode. Hudson Leick and Kevin Sorbo who plays Hercules have quite a good chemistry with one another. Sorbo generally tends to underplay the character of Hercules which on screen contrasts quite well opposite Leicks hysterical over the top performance as Callisto. 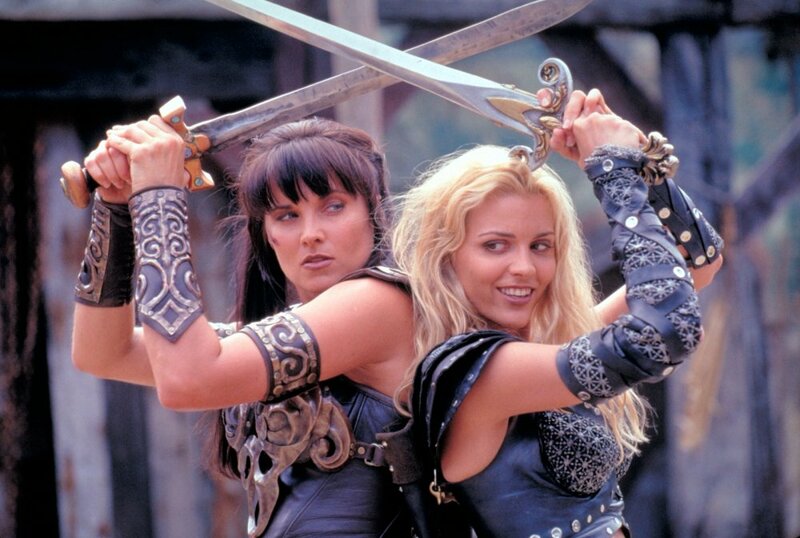 Its obvious that the character of Callisto lacks the same dynamic with Hercules that she had with Xena. It like having Superman fight The Joker. Yeah that’s fun, but its not the same as Batman and the Joker together. Still this story does mark a change in Callisto’s character as this shows her becoming an immortal. From this point on the character of Callisto would never just be an ordinary human being ever again. Callisto would next pop up on Xena in another season 2 episode “A Necessary Evil”. This story followed on from “Surprise” as we saw Callisto still trapped in the Labyrinth doing nothing but killing rats all of which she names Hercules. Callisto is ultimately freed by Xena of all people who needs her help. An enemy of Gabrielle’s, an Amazon named Velasca has managed to steal Ambrosia and used it to become a goddess. Velasca now plans to destroy Gabrielle and pursues her across all of Athens. Realizing that she is no match for a goddess, Xena seeks Callisto who is an immortals help. Xena promises Callisto the Ambrosia allowing her to become a goddess if she helps her take down Velasca. Callisto agrees, but soon not surprisingly turns on Xena and tries to make an alliance with Velasca. Velasca is wary of trusting Callisto, but Callisto assures her that they can be allies, even friends, due to Velasca’s hatred of Gabrielle and her hatred of Xena. Xena however ruins their fledgling friendship by making it appear that Callisto is trying to trick her. Xena later lures Velasca to a bridge above a large pit of lava. There Callisto is able to steal Velasca’s ambrosia and become a goddess. Whilst Velasca and Callisto are fighting Xena cuts the ropes on the bridge sending both villains plummeting to the lava below, where they are trapped seemingly forever, whilst still fighting with one another. Overall this is another brilliant episode. Its not hard to see why they kept bringing Callisto back as every single episode she was in had been an absolute classic at this point. Hudson Leick as always is excellent here. Even just little bits like when she winks at a grieving Gabrielle are wonderful moments of villany and dark humour. Callisto and Velasca played by Melinda Clarke play brilliantly off of one another too. They are both such different villains. On the one hand Callisto is a more sympathetic character than Velasca, who in contrast to Callisto had a happy upbringing and eventually murdered her own adopted mother Melosa to try and gain power. At the same time though whilst Callisto might be more sympathetic, she is actually far more evil and destructive than Velasca. Velasca is just a spoiled brat who wanted to rule the Amazons. Callisto is a damaged, unhinged sociopath who has suffered unimaginable loss and pain. She has even died and come back. Velasca is completely out of her league when she goes up against Callisto. The final moment where Callisto becomes a god and we actually see Velasca recoil in sheer terror at just the sight of the goddess Callisto is brilliant. Velasca has never shown fear before as she is so arrogant she believes herself to be superior to everyone around her, even Xena herself, but the sight of Callisto’s mad face staring back at her is enough to penetrate even her arrogance. My only problem with this story is that it turns Callisto into a goddess which no longer makes her a good match for Xena. Xena is a Batman type of hero. She is an ordinary human being who uses both her skills as a fighter and her overall intelligence to fight villains. Now Batman and Xena both work when fighting villains who are ordinary human beings. Like look at Batman’s rogues gallery. The vast majority of them lack super powers. Similarly Xena’s rogues gallery lack super powers too for the most part. Callisto, Draco and Cesar are all ordinary human beings. Ares is a god, but he does not want to kill Xena. He merely wants her back, so he wont kill her. Instead Xena vs Ares is more her trying to overcome his constant mind games, dirty tricks, and manipulations into making her go evil again. With Callisto as a goddess however its different. She is not an ordinary human being any more, she could kill Xena with the flick of her hand, and unlike Ares she really, really, really wants too. So when Callisto still loses to Xena also not only makes Xena too powerful, but also ruins Callisto’s menace too. As a goddess she often just gets buried under rocks by Xena. Callisto’s next appearance after “A Necessary Evil” was in season 3, in the episode “Maternal Instincts”. In this episode Callisto is freed from the Lava by Hope, Gabrielle’s demonic daughter. 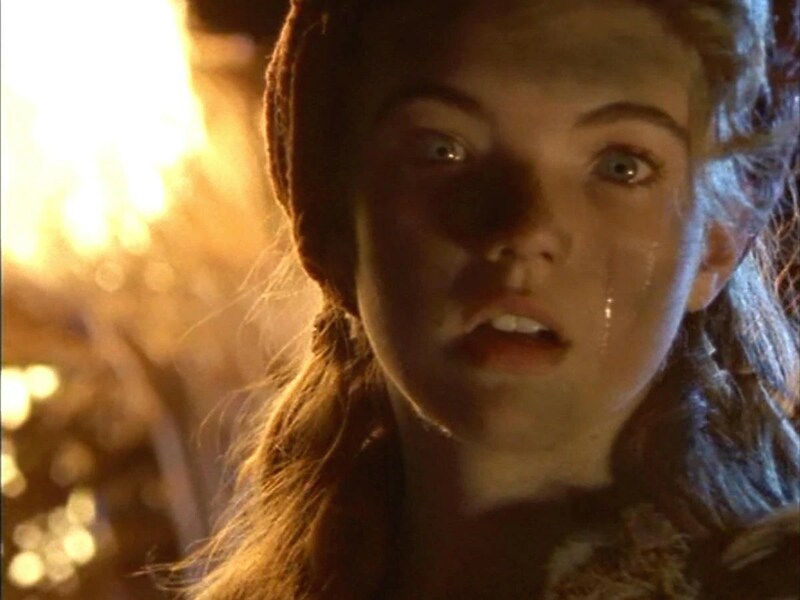 Earlier in season 3 Gabrielle was raped by the ancient Demon god Dahak and gave birth to his daughter. Though Hope was a creature of pure evil, Gabrielle found she could not murder her and lied to Xena that she had. Gabrielle placed Hope in a basket and allowed her to float down a river to safety, Hope has since grown from a baby into a child (with her demonic nature allowing her to grow at an alarming rate) Hope frees Callisto, but not Velasca. Velasca presumably remains trapped, though it is possible that Callisto killed her. Whatever the case Callisto and Hope go after Xena’s son Solon who is eventually murdered by Hope. Though Xena is able to defeat Callisto and trap her in a mine. Things are tense to say the least between Xena and Gabrielle. Now “Maternal Instincts” is one of my all time favourite ever episodes of Xena. I think it is a tv classic. Solon’s death is an excellent twist. It brings a whole new dynamic to Xena’s relationship with Callisto and Gabrielle. How simple it would have been to have had Callisto, Xena’s ultimate enemy kill Solon, but having it be Hope, just makes it all the more horrifying and I applaud the writers of the show for being that brave. Things really are never quite the same between the Warrior Princess and the battling bard ever again. I feel that this incident both drives them apart, but later brings them closer together as Xena ultimately forgives her, and Gabrielle later forgives Xena who in the next episode very nearly tortures Gabrielle to death in revenge. If they can get over that, then they can get over anything. Both Lucy Lawless and Renee O’Conner’s acting in that scene where they realise what Hope has done is among the best in the entire series. Its hard to say what is more effective Xena’s anguish or Gabrielle’s horrible feelings of regret, knowing that she has caused the death of her best friends son and also the realisation that her daughter is an utter monster after all. Callisto’s almost orgasmic reaction to Xena’s anguish is deeply disturbing too. I also love Callisto’s confrontation with Xena in the village after Solon has been murdered. Here Callisto comments on how despite her initial joy, Solon’s death brings her no happiness. She thought it would. After she lost her family her hatred was all that kept her going, but now that she has inflicted the worst pain she ever possibly could on Xena, making her lose her child, she has nothing left. Worse as she is now a goddess she can’t ever die. She’ll have to live as an empty shell for all eternity. Once again even though Callisto has taken part in the death of an innocent child. (She may not actually killed Solon, but she still helped Hope do it). You still can’t help but pity her that she is just so damaged and broken she can’t experience anything any more. Sadly however Callisto’s status as a goddess does limit her effectiveness at the end of the story. Her final fight with Xena at the end is just lame. Callisto barely puts up a fight. She was seemingly a lot stronger when she was a human. It also undermines the menace of Velasca too. Why the hell did Xena need immortal Callisto if she could just beat up a god no problem. Though I suppose you could say it was because of Callisto’s lack of enthusiasm for anything that she didn’t fight back. Callisto would appear in the next episode. The musical episode of Xena the Warrior Princess “The Bitter Suite”. However its only in hallucinations or as an apparition in the musical land of Illusia. Callisto’s next proper appearance was in the Hercules two parter “Armageddon Now”. This two parter was another classic (it seems at this point they couldn’t give Callisto a bad episode if they tried). Ironically goddess Callisto works better in Hercules than she does in Xena, as goddess Callisto is able to actually fight with Hercules and still seem like a genuine threat due to his super strength. 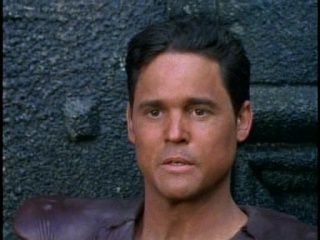 “Armageddon Now” sees Callisto freed from the mine Xena trapped her in by Hope. After realising how evil she was, Gabrielle poisoned her own daughter, and burned her corpse. Hope’s spirit however is able to reform parts of her charred corpse into a new zombie like body. In this form, Hope frees Callisto who is reluctant to keep working for her until Hope offers her a chance to rid her of her pain, provided she wipes Hercules from the history of the earth. Callisto soon goes to Ares. Ares who is tired of having his and his underlings plans constantly thwarted by Hercules agrees to work with Callisto to get rid of him once and for all. Ares and Callisto using their combined god abilities, free the evil alternate reality version of Hercules trapped in the nothingness between realities. The two also take the Hinds blood, the only thing that can kill a god from him. When the real Hercules shows up and fights his evil twin, Ares and Callisto open the portal to the nothingness between worlds and send both Hercules there. Callisto demands Ares give the Hinds blood to her. Ares not trusting her fights with Callisto for it. Callisto proves to be no match for Ares and gets thrashed by him pretty badly. However Callisto is soon given help from Hope who injects the power of her father Dahak into Callisto. Armed with this extra energy Callisto soundly defeats Ares and steals the Hinds blood from him. She then smears it on a dagger and stabs Strife, Ares underling to death. Now armed with the Hinds blood Callisto is safe to travel back in time with Hope’s help. All gods can travel backwards in time and that was why Callisto needed the Hinds blood as no god can stop her as she has the means to destroy them just like she did Strife, whom she merely tested it out on. Callisto goes back to try and murder Hercules before he was born by killing his mother whilst she was pregnant with him. Iolus is sent back by Ares to stop her, but he fails and Callisto murders Hercules’s mother and erases him from history. Callisto then travels back to when Xena originally raided her home village and save her family from Xena’s army. This was part of the deal she had with Hope that she would agree to kill Hercules as long as she got to save her family from certain death. Though Callisto as a goddess had the power to time travel anyway she did not know how to use it properly having been born a mortal without hopes help. Unfortunately for Callisto in trying to stop Xena’s army from burning them, she ends up killing her family by mistake, just making her pain even worse. Ioalus meanwhile travels back to the present only to find it a very different place without Hercules. Without Hercules’s influence Xena was never redeemed and is a ruthless emperor having conquered most of the known world. She is also utterly devoted to Ares and has Gabrielle who is head of a resistance movement against her tortured and then crucified before a horrified Ioalus. Ioalus is later able to find another way to travel backwards in time and manages to save Hercules’s mother from Callisto setting the timeline on its correct course. Both Ioalous and Callisto arrive back in the present now as it was. Callisto attempts to kill Ioalus, but Hercules manages to escape from the nothingness between worlds and after a battle with Callisto, is able to throw her through the portal, leaving her trapped between dimensions. “Armageddon Now” is a classic Hercules episode. Though it is riddled with plot holes. For instance if Callisto had managed to change her own history by sparing her family then she would never have become evil and never have gone back and changed her history. Also as Gabrielle is killed in the revised timeline by Xena then Hope herself would never have been born either. Still despite this overall this is a pretty strong story. Like I said earlier Callisto actually seems like a force to be reckoned with again in her battles with Hercules. Having her murder her own family by mistake in the aborted timeline is also a truly magnificent irony. I think Callisto as a goddess could have been in more Hercules episodes. This was the first time she was better suited for Hercules rather than Xena and its a shame they didn’t take advantage of it more. Callisto, a renegade god who wasn’t part of Olympus could have been a brilliant idea to explore on Hercules. I would have loved to have seen more episodes that pitted her and Ares together. Their fight on “Armageddon Now” is a definite highlight. Compared to the almost fun brawls between Hercules and Ares we are more used to seeing, this is just so brutal, vicious and nasty. Sadly Callisto would not appear on Hercules after this story. Though she did make a cameo in the next episode “Yes Virgina the is a Hercules” where she is comically shown to be playing rock scissor papers with Ares. Hudson Leick also played a parody of Liz Friedman a writer of the series in this episode as well another episode of series 5. Sadly however this proved to be Callisto’s last battle with Hercules. Callisto’s next appearance was in the Xena season 3 two part finale “Sacrifice”. Sadly however this two parter for me is one of only two weak Callisto episodes. I suppose they had to give her a poor story sooner or later. “Sacrifice” sees Callisto escape from the portal between worlds simply using her own godlike powers. She returns to our reality and begins working alongside Hope yet again with her reason being that she wants to die, and believes only Hope can give her the oblivion she desires. Callisto seeks eternal nothingness. No afterlife, no memories just nothing. Hope is finally able to repair her burned and damaged body and assumes the form of her mother. Hope is ultimately planning to allow her father Dahak to enter the world to ravage it. With that being her plan all along. Ares ultimately joins forces with Dahak, which in turn causes Callisto to switch and work with Xena with the promise once again being that Xena will kill her once this is all over. Armed with the hinds blood dagger that Callisto herself created Xena tries to murder Hope, but it is Gabrielle who pushes her into a pit of lava and seemingly falls in with her. Callisto laughs at Gabrielle’s death and remarks that this has finally given her a reason to live again. Xena however overcome with grief and rage at having lost everything, stabs Callisto in the stomach with the Hinds blood. Killing her a second time. Xena states coldly to Callisto “No more living for you” as Callisto falls to the floor dead. My main beef with this story isn’t really with how Callisto is portrayed. More Ares. I don’t like the way he switches sides and joins Dahak virtually without an explanation. Its so out of character for Ares to be happy being someone else’s lackey, or to betray Xena the woman he loves and whom he later gives up his godhood for, at the drop of a hat. Still I do like how Callisto is written in this story by and large. Unlike Ares, Callisto’s motivation for working with Hope and later even Xena makes sense. Her desire for permanent oblivion after all of the pain she has endured is rather moving, and ties in with the previous stories where she viewed her godhood as a curse. Sadly however as a goddess Callisto is at her most useless. She must get buried under rocks about 7 times in total throughout the story. I can definitely see why they killed her off as a goddess after this episode. The character works best as a normal human. Her death is a brilliant moment too. After having failed to work up the courage to kill her for so long, Xena finally does it in a moment of despair. Also the fact that she does it when Callisto has finally after a life time of misery found a desire to live again, is such a cruel irony and yet another time that Xena has wronged her. Callisto would not reappear for an entire year after “Sacrifice”. Callisto next appeared in the story “The Ides of March” where she is shown to have been sent to hell this time. She is given a chance by Satan himself to live again by bringing Xena’s soul to him by taking her off of the path of redemption. Callisto can not hurt Xena or interfere directly, instead she must manipulate her. Though Callisto who appears to Xena as a demonic spirit tries to manipulate the Warrior Princess, ultimately her plan fails and Callisto soon loses her temper and throws he shakram into Xena’s back breaking it. A crippled Xena and Gabrielle are soon captured, tortured and crucified. Though Callisto is robbed of her chance at life she takes solace in having finally achieved her revenge, as Xena and Gabrielle die in agony on the cross. “The Ides of March” is yet another all time classic. Here the character is given a brand new motivation. She agrees to help Satan get Xena’s soul, not so much because she wants to live again, but just because she can’t stand the idea of Xena’s soul going to heaven. Once again the viewer can have some sympathy for Callisto who is enduring eternal torment in hell having to watch as Xena the woman who wronged her so many times ascends to Heaven. Just the thought of it is enough to drive Callisto insane with rage and despair. I also liked how Callisto’s vision of hell wasn’t just the usual fire and brimstone but rather apparitions of Xena and Gabrielle laughing at her and then vanishing before she can strike them. Callisto would go on to reappear in the first episode of season 5 “Fallen Angel”. In this story Callisto has now become a Demon and attacks Xena and Gabrielle’s souls as they are ascending to heaven. She manages to drag Gabrielle’s soul to hell where she tortures her and very nearly transforms her into a demon. Unfortunately for Callisto. Xena leads a squad of Angels to hell and battles the demons. Though they are able to defeat Callisto Xena takes pity on Callisto who vows that she will spend eternity seeking revenge on her. Xena ultimately sacrifices herself and sends her angelic life force into Callisto’s soul. This purifies her and not only causes her to become an Angel but also forget her evil past and become what she would have originally become had Xena not burned her family. It is revealed that without Xena’s influence Callisto would have been a sweet natured, kind, loving and compassionate figure after all. Xena meanwhile takes Callisto’s place in hell as a demon and leads the rest of Hell’s forces to overrun heaven leading to an all out war. It is ultimately the newly redeemed Callisto that is able to save the day by helping Xena’s friend Eli bring both Xena and Gabrielle back to live. With Xena now restored as a human the forces of hell lose their leader and are driven back. As her reward for saving heaven Callisto is reunited with her family one last time. “Fallen Angel” is another classic episode, but it does suffer from some flaws. 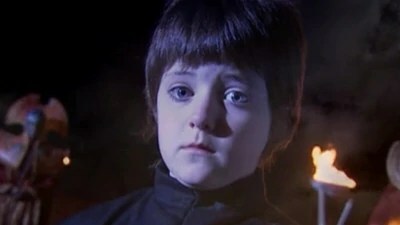 On the one hand it is a very exciting and dramatic story, and it probably contains one of the best performances from Hudson Leick in the entire series. Hudson as always is fabulous as the evil, now demonic Callisto, however she proves to be just as good as the sweet natured, heroic version of Callisto at the same time. There also many moving moments throughout the episode such as Gabrielle forgiving Callisto for murdering Perdicus and Callisto finally being reunited with her parents actually made me tear up the first time I saw it. Sadly however I don’t think this episode really resolves the Callisto storyline quite as well as I had hoped. It completely contradicts the original Callisto trilogy by making out that Callisto is evil only because of what Xena did to her. The whole point was that whilst Xena certainly let that side out, ultimately it was clearly always there. That’s why Callisto became a monster, whilst Gabrielle and the man whose son Callisto murdered and even Xena herself ultimately didn’t. Here however Xena is shown to be 100 percent responsible and we find out that without Xena burning her family she would have been a sweet, wimpy goody two shoes. Also its a bit much after everything we have seen Callisto do that in the end all that happened was Xena shot a big bright white light into Callisto and she became good. I actually think that the ending they had for Callisto on Hercules would have been better. Callisto was to have originally appeared in the first episode of season 6 of Hercules called “Be Deviled”. Here her demonic soul would have escaped from hell and tried to save her sister. It would have been revealed that her sister had actually survived Xena burning her village after all, and now her sister was being driven by the same hatred she had into becoming a monster. However ultimately Callisto would have prevented her from going down this path and making the same mistakes she did. I am so annoyed that they didn’t use this story. This would have been so much a better ending to Callisto’s character. It would have tied into the original story arc so much better by having Callisto actually achieve her redemption on her own. Rather than just have Xena pull the switch on her back from evil to good. Also having her return to hell to willingly face her punishment too would have been a fitting end that would have tied into “Intimate Stranger”. They fact that they ditched this story and went with the angelic Callisto is in my opinion as big a mistake as if they had had Xena pull Callisto out of the quicksand in “The Return of Callisto”. Sadly it would get even worse for the character in her next and final appearance “Seeds of Faith”. This story was a truly dismal end to Callisto’s character. She basically does nothing but float around going on about how fabulous everything is. Ares is in the story, but he and Callisto have no scenes together which is annoying. I also don’t really like the idea of Callisto becoming Xena’s daughter as it basically wrote off any chance to see the villain ever again. Of course Callisto being Xena’s daughter would lead to Eve the reincarnated Callisto, who was in many ways the scrappy of Xena, though a large part of that was probably because she killed Joxer. I guess Callisto finally got Joxer after all. Still I am not going to look at Eve as most people do not consider her to be the same character as Callisto and truth be told she isn’t. For us to end on that note is a little sad, still even with the unsatisfactory resolution to her arc, I would still rank Callisto as one of the greatest villains of all time. She is easily one of the best written and acted villains in tv history. I think its such a shame that she is so overlooked. I think Callisto deserves to be seen as one of the great archenemies that everybody knows like Professor Moriarty, The Joker, and Lex Luthor. I think in her own way she is every bit as strong as any one of those characters. Up until the end Xena and Callisto have the perfect villain/hero feud. Xena the Warrior Princess is overall very overlooked nowadays. You virtually never see it referenced any more which is such a shame. It is still very influential on other programmes. You’d be hard pushed to find another show from that era that has had as big an impact save Buffy. Sadly however it tends to be looked down on by mainstream critics. I only hope this changes and in time when people mention the great hero and villain feuds, Callisto/Xena is mentioned alongside Batman/Joker, Superman/Luthor, The Doctor/The Master and Harry Potter/ Lord Voldemort as Xena/Callisto can certainly hold its own with any of them. Callisto was very clearly influenced by the Joker, Batman’s archnemesis. It makes sense as Xena in many ways could be seen as a female Batman. Xena is Batman to Hercules’s Superman. Hercules and Superman are the all powerful and perfect heroes who are beloved and trusted by everyone. They tend to fight all powerful beings like Ares and Darkseid. Xena and Batman however are the darker heroes who are more human. They have no powers and have to rely on their wits and intellect and own remarkable physical prowess to save the day. They are also not always trusted by everyone around them either due to their darker nature. Also where as Superman and Hercules are very honest, likable and trustworthy, Xena and Batman are very quiet, reserved even somewhat humourless and dour on the surface. Both Batman and Xena tend to fight evil human beings, crooks, mobsters and warlords. Also finally Ares could be seen as Xena’s version of Catwoman, but with the gender roles reversed. He is the villain that tempts the hero and is in love with them at the same time too. Thus what Xena who was for all intents and purposes a female Batman really needed was a Joker. She had her Catwoman with Ares, now she needed a nemesis who truly hated her and was completely and utterly unpredictable. A villain whose more jovial and gleefully evil personality would contrast with the stoic silence of the main hero. Callisto fulfilled this role perfectly. She was Joker to Xena’s Batman. 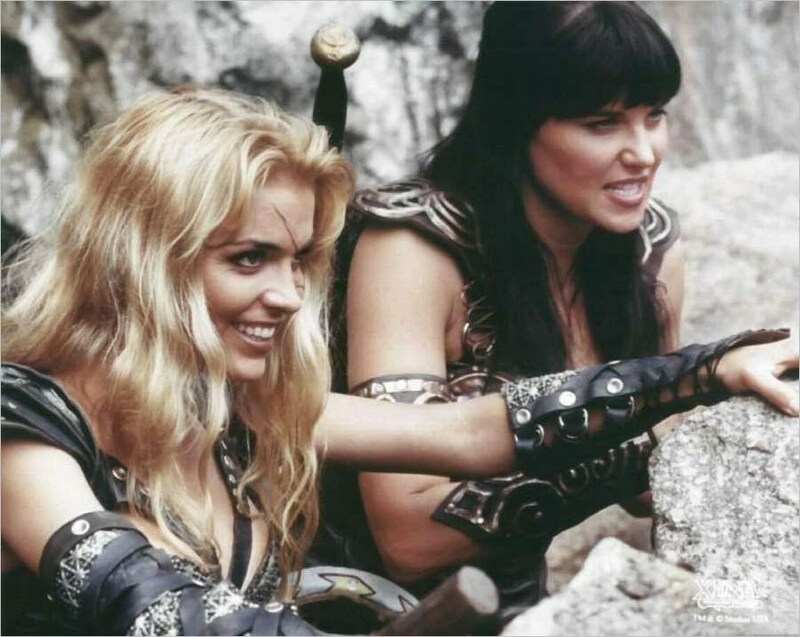 They have the same type of interactions with one another with Callisto often having a big evil grin on her face and making sick jokes and laughing her head off, whilst Xena often always had a serious look on her face and was very dour and humourless in the face of her more flamboyant enemy. The comparisons between Callisto/Xena and Joker/Batman run deeper than that. Batman as well know made the Joker. In most versions the Joker is pushed into a vat of chemicals which scars his face, turning his skin chalk white, his hair bright green and deforming his mouth into a hideous grin. This drives the Joker mad and leads to his life time of villany. Similarly it was Xena who made Callisto. She burned Callisto’s family causing her to go insane. Both the Joker and Callisto have regularly said the exact same words “You made me” to Xena and Batman and that’s what makes the Joker and Callisto such effective villains for those heroes. They literally could not exist without Batman or Xena, and they and the misery they cause are constant reminders of both Xena and Batmans failures. I think Callisto is really the classic example of a modern day nemesis who is created more in the mould of the Joker. When you look at earlier works of fiction a heroes archenemy was often created in the mould of Professor Moriarty. However I think that Callisto being one of the first villains who was created in this mould other than the Joker himself, was also among the most influential. For instance I think that the Master in the new Doctor Who was inspired to some extent by Callisto among other things. The Joker was clearly the biggest influence on the Master in the new who, but one shouldn’t still discount Callisto’s influence. Russell T Davies the showrunner of the new Doctor Who series from 2005-09 is a huge fan of Xena and has cited it as a big influence on his career. He has cited the character of Xena a lesbian icon as being a big influence on creating his own gay icon Captain Jack Harkness. Many have also drawn comparisons between Xena and Harkness as both are bisexual characters who reverse the negative stereotype of LGBT characters being weak and effeminate. Both star in much darker spin offs from more established series. Both also have dark pasts as well, with Jack even being at one point pursued by someone he wronged in his past. His very own brother whom he left to suffer at the hands of aliens and who is driven completely insane as a result. There are shades of Callisto and Xena in Jack and his brother John Gray with John Gray wanting to tear Jacks life apart and feeling he made him into the monster he is by abandoning him to endure decades of torture at the hands of vicious aliens. The Master during Davies’s time had some similarities to Callisto. Like Callisto he was someone who had been scarred as a child and driven completely insane by it. We find out in Davies’s time that as a child the Master had been forced to stare into the untempered schism a hole in the fabric of time and space itself. All time lords were forced to do this at a young age. It was an initiation ceremony and most of them were inspired after staring into it, whilst some ran away (such as the Doctor) but in the Masters case it drove him mad. From that point he first looked into it he heard a constant drumming in his head that tormented him and made him into the homicidal lunatic he is now. Like Callisto we are left to wonder what the Master could have been had it not been for this tragic event. However just like with Callisto it is also hinted that perhaps the Master was always destined for this many times too and the drumming just let the real him out. The Master and Callisto as children in the moments that haunted them for the rest of their lives. In both cases we as viewers are left to wonder if it was really these two moments that made them, or if the monster was always there lurking under the surface of even those two sweet innocent children and would have always found a way to emerge sooner or later? In John Simm’s final performance as the Master we see how it was actually the time lord Rassilon who planted the signal in his head that was the source of the drumming that drove him mad. When he confronts Rassilon the Master even repeats both the Joker and Callisto’s famous line “You made me”. Finally the Doctor and the Master’s relationship has shades of Xena and Callisto. Though the Doctor did not make Callisto, he still feels protective of the Master and even refuses to kill him. In some ways the Doctors refusal to do so is out of guilt not out of having made the Master, but at having killed his own people. With the Master being the only other member of his kind left the Doctor hopes that perhaps by saving the Master he can redeem himself of his past sins. Thus much like with Xena and Callisto, its guilt that prevents the hero from killing their worst enemy. Finally Callisto also bares a similarity to two villains from the Buffyverse. Some have drawn comparisons between Faith, Buffy’s nemesis and Callisto. I must admit I have not seen the similarities between these characters quite as much. There are some such as the episode where Buffy and and Faith switch bodies that has shades of “Intimate Stranger” and the way that Buffy once again feels a certain sense of guilt and responsibility for how Faith turned out. Plus Buffy and Faith’s interactions with each other are all somewhat similar to Callisto/Xena. Right down to the sexual innuendo, villain blaming the hero for their mistakes and heroes sense of guilt over the villains descent into darkness. However it is Daniel Holtz, Angels archenemy from the spin off series that I feel is most like Callisto. Holtz much like Callisto’s family was killed by the protaganist of the series, the Vampire Angel when he was evil. Like Callisto he gets no solace in Angels redemption and still seeks to make him suffer. Like Callisto, Holtz even goes after the main heroes son and uses someone very close to the hero to do that in Angels case, Wesley Wyndam Price. Just as Xena tried to torture Gabrielle to death; Angel tries to murder Wesley for betraying him to Holtz. Angel was in many ways just a male Xena. Angel just like Xena began as the love interest of a more straight forward hero before getting his own show. Angel just like Xena had once been the most evil person of all time. Xena had once been the destroyer of nations whilst Angel before being cursed with a human soul was the scourge of Europe. Angel has to deal with someone who tries and lures him back to the dark side just like Xena. An old lover the vampire Darla. Darla fulfills a similar role to Ares in Xena. Both are in love with the main hero and want to see the main hero return to their former evil ways, so that they can resume their relationship with them, and because they believe they are not living up to their full potential by being a whiney do gooder. Angel has his Hercules with Buffy, the noble hero who had redeemed him, and he had his Ares with Darla the old flame fro his past who tried to take him off the path of redemption. What he needed was a Callisto, a villain who he had actually wronged and thus was a reminder of his dark past in a different way. Holtz ultimately fulfilled that role. He was a male Callisto as much as Callisto herself was a female Joker. Joss Whedon has regularly cited Xena as a big influence on both Buffy and Angel and fans have drawn a number of comparisons between many characters on both series. As you can see Callisto not only drew very heavily from the Joker but also was in some ways influential on a number of villains who came after her too..
Don’t think you’ve watched ‘The Sacrifice’ episodes properly. #1: Ares was clearly brainwashed, hence why that fire shot up behind him while he was rallying his troops. It’s not that hard to infer. #2: Callisto’s switching sides proves how temperamental she is, and plus, he battle with Xena was finished after she killed Solan. It was obvious. She didn’t want to fight Xena anymore. She barely mentioned Xena in her crossover in Hercules. And without Xena, she was nothing, hence her motivation for wanting to die, no matter what. Why would she wait on Hope and Ares for it? She wasn’t serving Hope out of love or reverence for her. There was an emotional detatchment throughout the entire double episode. I think also once she had killed Solan, Callisto felt even with Xena, like an equal, and this made her seeking out Xena’s help a plausible partnership. All you have to do in those episodes is use your general smarts to figure out what is happening. It’snot bad writing at all.